I watched some episodes. In general, this anime is pretty good. If you like cooking and cake, and romance, then this anime is for you. If you dont like kids romance and annoying a bit with the main heroine being clumsy and crying babe, then you might consider watching it. overall, I love this anime since I love cake and cooking. Forgot to mention. The author of this manga is the same one who created Saint Dragon's girl....whatever I dont remember exactly the name. When I saw this anime going to appear on Crunchyroll I became interested in it, and saw the beginning of it, and enjoyed it. It does have a different storyline but also has some similarities as others but not so that is a rip off. Yumerro Patisierre is about a young outgoing clumsy crybaby girl who enjoys cakes and finally realizes her talent and dream when meeting a young man that baked a cake with the same taste of flavors her grandmother makes. When Ichigo Amano sets off school, she meets friends in unexpected places, and learns the lessons of life as she starts her journey to her dream. Now if you enjoy, Shugo Chara, Ristorante Paradiso, and La Corda dOr you'll enjoy this one. Okay I know they aren't exactly the same as far as the storyline goes but you'll notice the similarities in them. So this is a great anime very cute i love the story line. Two comic books come to mind when i started to watch this anime they were Kitchen Princess and La Corda d' Oro. Well Kitchen Princess was made by the artist of this series her name is Natsumi Matsumoto. 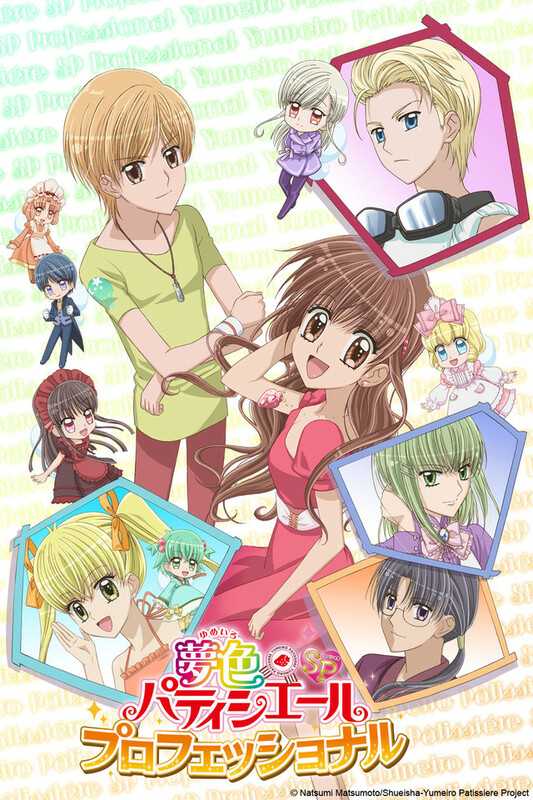 And La Corda d' Oro reminds me of this anime by the main character having a fairy as a spirit that helps her out in La Corda d' Oro the samething happens in that story line too. They are all very cute animes and fun to watch. So if you love to watch sweets and how they are made and the main character goes through adventures and tasks to learning how to become a great pastry chief then this anime is defently for you!!! Amano Ichigo, Ichigo means strawberry if you don't know that. Yumeiro Patissiere, well im on episode 6 and so far it's about cooking sweets. The music is ok. The characters are very good and the animation is very good too. It's about Amano Ichigo wanting to be a baker and I LOVED IT when i saw it it was really good. You should watch it too. Anyone who enjoys fairies, pastries, and humor, Yumeiro Patissiere is the anime for you. Amano Ichigo is a 14 year old clumsy girl who dreams to be a patissiere(pastry chef) in order to reach the founder of Ichigo's talent, Henry, who is in Paris, when Henry discovered her, he made her go to a Pastry learning school, where she met and teamed up with the Princes of pastry in the school. Now, they enter the Grand Prix, whoever wins, they will be able to go to Paris to work with Henry, will Amano Ichigo win in order to see Henry-sensei again? It is still a mystery...watch the anime to know better! There's a lot about this series that's very typical shoujo. The heroine Ichigo is a klutzy girl who thinks she talentless and finds out there's one area she excels in: she inherited great tastebuds from her world-renowned pâtissière grandmother. So from that point on, she's determined to become a pastry chef just like Grandma. She enrolls in a famous school and finds that she knows nothing compared to others, but with constant hard work and the aid of a little guardian spirit named Vanilla, she slowly begins to learn about the trade she's chosen. Her hard work wins the admiration of some, and the enmity of others, and there are contests and competitions to get through involving all of them. By the end, I'm sure her perseverance will have won everyone over. But there are things that make it a bit better than average for me. One is that I'm actually learning something from the show. For instance, I've make puddings for years and never knew about some of the techniques they mention for improving them. So her food doesn't magically taste better. She has to learn the right way to make it, and after that her ability to think about her customers and be creative is what makes it so good. Another thing I like is that the three 'princes' at the academy immediately become her allies, though one is a grudging one. Often in stories like these the pretty males are unattainable, standoffish characters that you don't really get to know until closer to the end of the series. Here, because they're Ichigo's partners, we get to meet them straight off, and their friendship with her is a bright point to the series. So yes, it's typical, but there are things I enjoy that will keep me watching. It's worth giving a try if you enjoy food-related anime and shoujo. my review and why you ned to watch it ! i'd say this is a good series, and for people who are wondering to watch it or not.. DOOOOOOOO!